Home Blogs Snap Shots What Compact is the best? Camera technology is accelerating at an enormous pace. It only seems like a couple of years ago when we were looking at mini film cassettes to make compact cameras even more compact. Size was everything. Small size that is. Now we have digital everything. Panasonic have launched a camera that can brush up, clean up and even put make-up on the subject’s face. The Panasonic Lumix FX77 has a “beauty re-touch” function that will whiten teeth, increase the translucency of the subject’s skin, remove dark eye circles, make the face look smaller and even magnify the size of the eyes. If that is not enough to make the subject look beautiful, then the camera has an application that will apply rouge, lipstick and even eye shadow. With functions these days, the larger the better. So, you are in the market for a digital compact, which one of the hundreds will you buy? That question is about the same as “What car should I buy?” All cameras today will produce reasonable photographs. However, like all cars which will get you from A to B, some are capable of doing it better than others. Firstly, how much do you want to spend? It is a total waste of time looking at a new BMW if all you can afford is a second hand Corolla. Set a ceiling on your budget and work from there. The next item in the search for a camera is what you want to do with it. Sure you want to take photographs, but do you want to be a creative photographer, or just take snaps of family outings at the beach? If you do not want to “get involved” with photography, then a simple, cheap compact “Point and Shoot” is all you need. However, if you want to try and master the art of photography then you must look at some top end compacts that will allow you to fiddle with shutter speeds, etc. 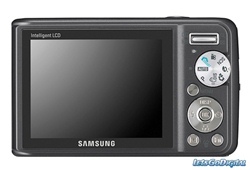 The top of the range compacts have lots of features previously only seen in SLRs. Let’s get megapixels out of the way. More megapixels in a compact camera does not mean that you will necessarily get a better final picture. It is all very complicated, but I just suggest you look at something between 5 and 10 megapixels as having more than enough for what you want a compact camera to do. Now the lens. Get a camera with an optical zoom, rather than a ‘digital’ zoom. Most compact digital cameras feature a 3x zoom lens, which offers a reasonably wide-angle setting at one end and a short telephoto at the other. Some of the larger compact cameras offer a more generous optical zoom, like the Canon PowerShot, which combines a 12x zoom lens with an image stabilization system. I suggest that you look at any one that has a range in the focal length of the lens. Generally these are called something like 28-70 or 38-105. This sort of range gives you the advantage of a wide angle lens and a small telephoto all built in. What to look for here, is just how easy is it to look through the viewfinder and see what you are going to get in the different lens positions. With most compacts you can also use the LCD screen to compose your pictures, but remember that the more you use the LCD, the sooner the camera runs out of batteries. The majority of compact cameras no longer have optical viewfinders, so a clear and bright LCD is essential for composing shots. A 2.5 to 3.0 inch LCD is preferable. Bigger is better again. Now the ASA. A good range, typically from 50 to 800 ISO, gives you the best chance of getting the shots you want without resorting to built-in flash. However, try as much as possible to run around 100-200 ASA. You will get better snaps, without “noise”. If you are a very disciplined type of photographer, who always keeps the rechargeable batteries fully charged, then get a camera which takes rechargeable ones. If this just isn’t you, then get a compact using standard off-the-shelf batteries. Finally – try before you buy! Previous articleWhy is PACS significant in modern medicine? Is your camera at risk?